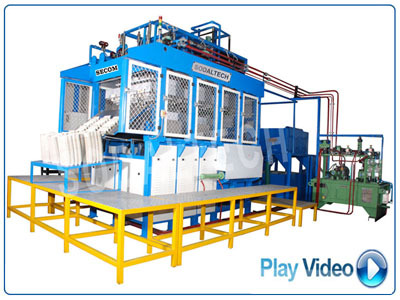 This model machines are known various names like fine pulp moulding machinery, fine pulp moulding system, fine pulp moulding equipments, dry type moulding (molding) machinery, pulp thermoforming machinery, direct hot press machinery, dry in mould, cure on mould, cure on moulding machine, cure on moulding equipments, cellulose fibre moulding equipment to the packaging industry, fibre moulding equipments, pulp and fibre moulding machinery, tray making machinery, tray making equipment, egg box moulding machine, quality pulp moulding machine. Copyright © 2012 K.U. Sodalamuthu & Co. (P) Ltd. All rights reserved.